Anantara Hotels, Resorts & Spas’ newest Abu Dhabi island hideaway, Anantara Sir Bani Yas Island Al Sahel Villa Resort, offers an unrivalled blend of rustic luxury, natural tranquillity and breathtaking wildlife encounters. Anantara Al Sahel Villas joins Anantara’s two existing properties on the ruggedly beautiful Sir Bani Yas Island – Desert Islands Resort & Spa by Anantara overlooking the glittering Arabian Gulf, and Anantara Al Yamm Villa Resort on the island’s eastern shore, culminating in a trio of unique resorts that reveal all of the desert island’s intriguing natural contrasts. 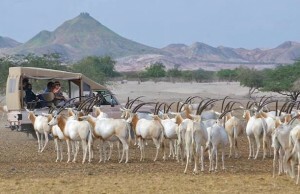 Exclusively located in the heart of the 4,100 hectare Arabian Wildlife Park, home to stunning landscapes and over 10,000 free roaming animals, guests arrive by 4×4 land cruiser to find themselves immersed in a desert savannah retreat that feels spacious and secluded with a luxurious sense of natural harmony. 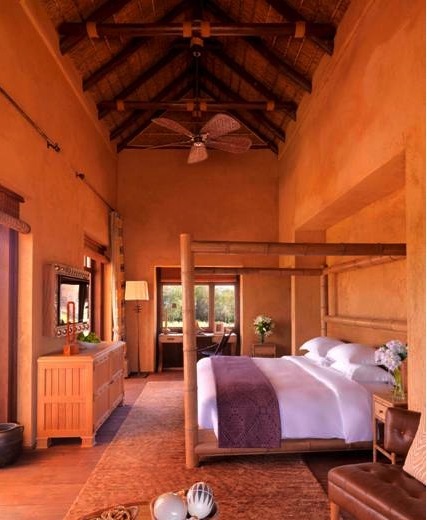 Elegant facilities and boutique accommodation feature traditional thatched roofing and have been thoughtfully developed for minimal environmental impact. Care for nature extends to peace of mind for guests and as a haven of natural serenity, the resort is designed with couples in mind and is pleased to welcome families with children aged 12 years and older. 30 luxury rustic villas are surrounded by salt dome hilltops and lush grass savannah where elusive gazelles and Arabian oryx graze, treating guests to glimpses of the island’s exotic wildlife while they relax in total comfort. Three accommodation types invite couples to romanticise in a One Bedroom Villa or to indulge in a larger One Bedroom Pool Villa with separate lounge and dining spaces, as well as a personal plunge pool. Spacious Two Bedroom Pool Villas are ideal for families and friends travelling together, and all villas feature Anantara’s signature amenities and authentic indigenous touches. Villa exteriors complement the natural surroundings and interiors are filled with natural light to illuminate traditional wooden furnishings, ceiling beams and local handicrafts. After a day of adventure, explorers can unwind by soaking in the free standing freestyle bronze bathtub and fall asleep in a sumptuous king size bed to the sound of desert island nightlife. The bay window seat and lounge furnishings provide cosy spaces to watch the savannah come to life around your villa. Blending views of nature and wildlife from villa comfort with journeys of exciting discovery, safari style guided walks and drives in the protected nature reserve offer close encounters with the rare and endangered animals that call this paradise home. Guests can also master the ancient Arabian sport of archery, kayak through lagoons and mangroves that are frequented by flamingos, and mountain bike across desert salt flats and undulating hinterlands. The indulgent traveler can opt for a transfer to the island in a scenic seaplane flight to reveal a spectacular bird’s eye view, while snorkellers can meet exotic marine life beneath the Arabian Gulf’s surface. Equestrian enthusiasts can ride stately Arabian horses and other fine breeds at Sir Bani Yas Stables, which offers lessons in beautiful outdoor paddocks and a variety of riding packages, from treks through the Arabian Wildlife Park and along sandy shores, to the romance of watching sunrise and sunset on horseback. 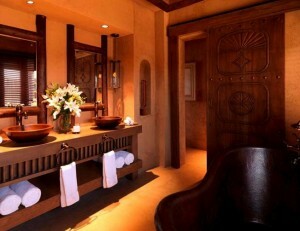 Dining at Anantara Al Sahel Villas is a mouthwatering affair, with the signature restaurant Savannah Grill offering a luxurious safari lodge venue to savour impeccable western favourites and traditional African specialties. Extending the sophisticated pleasures, a private Cigar Lounge offers a fine selection of international cigars for aficionados. Guests are further spoilt for choice with the freedom to choose between any of the restaurants and bars at all three of Anantara’s resorts on the island, opening up a world of flavoursome possibilities in a variety of distinctive settings. Catering for leisure and business guests, resort facilities include the well-equipped workout room with a media hub for iPod, USB and TV channel selection The swimming pool entices energising laps, sunbathing on loungers and cocktails on the deck.